This year’s Inside project, situated in the Tarble Atrium, is a site-specific installation by artist, Diana Al-Hadi, called Smokescreen. Al-Hadid is known for her gravity defying painting and monumental sculptures that use disparate source materials to emphasize form, the artist’s curiosity about history and the process of creation. Her resplendent and systematic expressions cross cultures and disciplines, challenging the practices of architecture, ancient invention, science, mythology, and Old Master works. Al-Hadid’s works first take form on Mylar, and later transform onto panels and monumental sculptures comprised of polymer gypsum, plaster, fiberglass, wood and steel. Visually, the works defy the boundaries of architecture, figuration and abstracted imagery. Al-Hadid’s works are interwoven and undulating compositions that contradict the space they inhabit with their fluidity, mass and source material. Smokescreen is a unique work, comprised of 6 panels that will span over 30 feet within the Tarble’s Atrium. Almost curtain like, the work serves as a passageway, inviting viewers to contemplate their own understanding about the dissolving imagery and narratives woven and painted throughout its spatial plane. The work also reexamines the use of the Tarble’s Atrium to define the space as yet another area within the building of artistic production. The process of creating such an object is both additive and subtractive, and evident by the layering and obscuring of materials and images interspersed with meticulously placed drips. Smokescreen is a physical, yet artful reminder about the various narratives created within the Tarble’s Atrium and main galleries and our subsequent and multi-faced understandings of those endeavors. 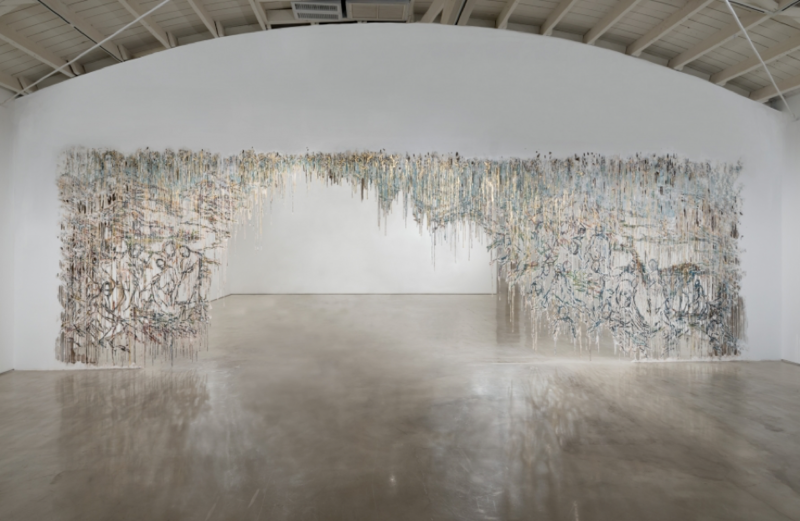 Diana Al-Hadid was born in Aleppo, Syria, and immigrated with her family to the United States 1986. She received her BA and BFA from Kent State and her MFA from Virginia Commonwealth. Al-Hadid has also received a Skowhegan residency, a Joan Mitchell Foundation grant, Louis Comport Tiffany grant, a Pollock-Krasner Foundation Grant, a New York Foundation for the Arts fellowship in Sculpture, and a United States Artists Rockefeller Fellowship. She has shown at the San Jose Museum of Art, Brown University, the Hammer Museum, the SCAD Museum of Art, Nasher Sculpture Center, The University of Texas at Austin, and DePauw University among many others. Al-Hadid lives and works in Brooklyn and is represented by Marianne Boesky Gallery.